HipCityVeg is one of Philly’s must-try vegan restaurants. Photograph courtesy HipCityVeg. There’s no denying it: Philly is a vegan dining destination. Our vegan restaurants scene continues to grow, and this year, the city held its first Vegan Restaurant Week. And if you’re looking for some meat-free places to dine, we’ve compiled a list of 20 vegan restaurants across the city. From the diner vibes at The Tasty in South Philly to the deli-style fare at the Luhv Vegan Deli in Reading Terminal Market, there’s a wide range of vegan restaurants to try. Keep this page bookmarked for the next time you’re stuck looking for a quick vegan breakfast, a tasty vegan lunch, or gourmet vegan dinner. V Street combines street food and vegan delights under one roof. They not only offer dinner seven nights a week, but they also have a happy hour menu and brunch during the weekends. The reasonably priced menu features everything from Kung Pao cucumbers (with grilled celery, peanuts, and crunchy shallot), to KFT tacos (Korean fried tempeh, radish kimchee, and a spicy special sauce). While Mama’s isn’t strictly vegan, they do offer vegan options and are also completely kosher. Make sure to try the falafel — they claim to have “best damn falafel in Philly.” As far as the rest of their menu goes, it has all the traditional Middle Eastern favorites that you can’t live without. Okay, so by now we all know that cheesesteaks are a big deal here in Philly. If you’re a vegan, however, big piles of meat and cheese aren’t really appealing. But Wiz Kid is here to change with their completely vegan steak shop. What gives the sandwiches their “meaty” taste? Wiz Kid creatively uses seitan, tempeh, and tofu to mimic the taste and texture of meat. 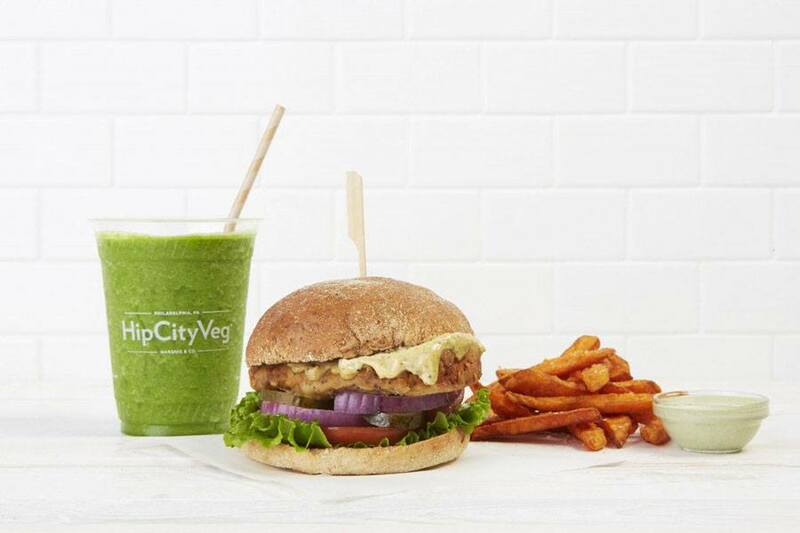 For easy vegan breakfasts and lunches, there’s nothing better than HipCityVeg. Their fast-food-esque vibe makes it easy to grab a quick bite. The best part: There’s no questioning what is and what isn’t vegan on the menu, as it’s all plant-based. Their burgers and chicken sandwiches and sweet potato fries are to die for, and if you’re in the market for something sweet, go for the banana whip or one of their milkshakes. Bar Bombon remixes traditional Puerto Rican recipes with plant-based ingredients. Not to mention they do it quite deliciously. Drop in for some Philly “steak” empanadas or a buffalo cauliflower taco. Either way, you can’t go wrong. At Pure Sweets & Co., eating vegan is easier than ever. Whether you’re in the mood for a salad, sushi, pizza, or brunch nachos — they have it all. They also offer an array of pastries, cold-pressed juices, and smoothies. Plus, there should be warning labels on their cakes — they’re that addicting. Two words: Tehina milkshakes. The plant-based frozen treats make for a delicious end to any meal, especially when preceded by one of their crispy, savory falafel sandwiches. Under the same ownership of V Street and Wiz Kid is another plant-based restaurant, Vedge. However, unlike the other two eateries, Vedge takes a more upscale approach. Serving dishes like eggplant braciole and rutabaga fondue, Vedge turns simple ingredients into elegant fare. New Harmony is technically a vegetarian restaurant, but they also serve up a ton of vegan dishes (and keep kosher). If you’re in the mood for classic Chinese dishes, with a vegan twist, you should definitely drop in. While they may not have an Instagram or Twitter, the owner, Ming, is very active on Facebook. Every doughnut here is vegan, which means the only thing a dedicated vegan needs to decide is whether they want a fruity flavor — like hibiscus lime or blueberry — or want to opt for the more indulgent — like chocolate marshmallow or chocolate Oreo. This vegan coffeehouse is always thinking of new recipes for their customers to try. For instance, one week they had a full on Italian Hoagie as their special. A month later, they unveiled their Pumpkin Biscoff cream cheese. Grindcore House makes veganism feel effortless and accessible, which is all the more reason for you to stop by. Charlie Was a Sinner is another one of our vegan restaurants that takes plant-based fare to another level. Dishes like their roasted cauliflower steak and potato gnocchi make this a prime location for a little date night action. Not to mention that the cocktail (or mocktail) list is an ideal addition to any meal. If you still have room, check out one of their desserts (lookin’ at you, pumpkin “cheesecake”). Pizza. Is. Life. There are few dishes that unite all people like pizza. Blackbird Pizzeria is like your local pizza shop — except it’s all vegan and with way more interesting flavors. Don’t believe me? There’s one pizza called “Brunchbird” topped with tofu scramble, seitan bacon, sautéed spinach, garlic butter, and violife mozzarella. It doesn’t stop there; they also have calzones, sandwiches, salads, wings, and sides. What are you waiting for? In Reading Terminal Market lies a vegan deli complete with all the meat-and-dairy-free cold cuts and cheese your little heart desires. Not only can you get all of the vegan meats and cheese cut fresh in front of you (like a typically deli), you can also get sandwiches, wraps, veggie burgers, and their revered tuna salad. Whether you get an actual meal from here or stop by to see what they have to jazz up your typical vegan meals, Luhv is definitely worth checking out. The Tasty is a vegan diner in South Philly that takes all the traditional breakfast offerings and veganizes them. Whether you’re craving a chik’n and waffle, breakfast sandwich, or biscuits and gravy, they have it all. There’s even a lunch menu if you’re a late riser. This cozy South Philly restaurant doubles as a vegan catering company. They mainly open to the public for dinners on Friday and Saturday nights, so getting into this spot is a little exclusive. After securing your spot, however, you’re in for a delectable five-course treat. Honest Tom’s rid their shop of animal products this past summer and haven’t looked back since. The taco menu now features options for fillings such as sweet potatoes and grilled vegetables. While this isn’t one of the city’s full-fledged vegan restaurants, they have ever-changing vegan options. Some of their current options include chicken fried cauliflower, charred green beans, a smoked coconut club sandwich, Old Bay jackfruit cakes, and plenty more. If you want the pub aesthetic without the pub food, this is the place for you. Whether you come for their $1 taco nights, or just happen to drop in, you’re in for a good time. The cash-only restaurant does not prominently display their vegan fare, but it does exist. They offer soy chorizo, seitan, spinach, and mushrooms as well as soy crema and vegan cashew-based cheese. Unlike certain other vegan restaurants, Front Street treats vegan as the standard. Instead of using markers to show which meals are vegan, the vegan meals are the ones unmarked. Every other option displays a small icon that’s representative of which animal product is used in the dish. Not only is the atmosphere stellar, but also the food is delicious. Their buffalo cauliflower is notably good as well as their quinoa oat porridge.